T.R.R. 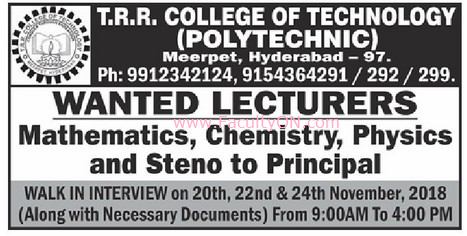 College of Technology (Polytechnic), Hyderabad has advertised for recruitment of Teaching Faculty- Lecturers / Steno jobs vacancies. Interested and eligible job aspirants are requested to walk-in on 20th, 22nd and 24th November 2018. Check out further more details below. About College: With a whole world of career options opening up. Focused career-oriented professional courses are the need of the hour . The highly specialized field of polytechnic is an area that provides unlimited opportunities for talented aspirants.